Sarah Nader- snader@shawmedia.com Woodstock's Jenifer Crain is guarded by Woodstock North's Haley Ahr while she shoots during the second quarter of Thursday's Class 3A Marian Central Regional final February 19, 2015. 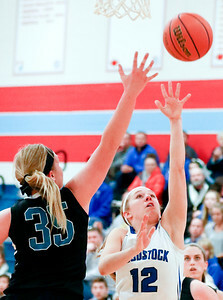 Woodstock beat North, 57-48. 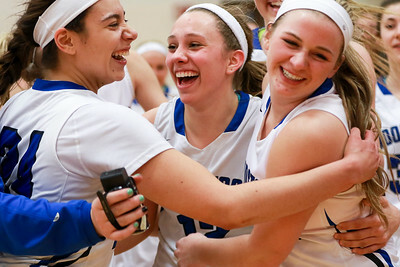 Sarah Nader- snader@shawmedia.com Woodstock's Selena Juarez (center) celebrates with her team after winning Thursday's Class 3A Marian Central Regional final against Woodstock North February 19, 2015. Woodstock beat North, 57-48. 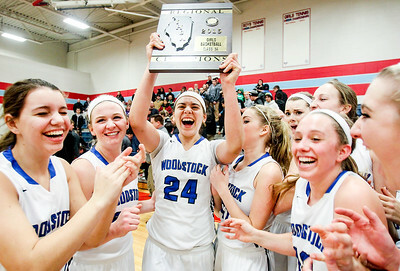 Sarah Nader- snader@shawmedia.com Woodstock player celebrate after winning Thursday's Class 3A Marian Central Regional final against Woodstock North February 19, 2015. Woodstock beat North, 57-48. Sarah Nader- snader@shawmedia.com Woodstock's Selena Juarez (center) passes to a teammate during the second quarter of Thursday's Class 3A Marian Central Regional final against Woodstock North February 19, 2015. Woodstock beat North, 57-48. 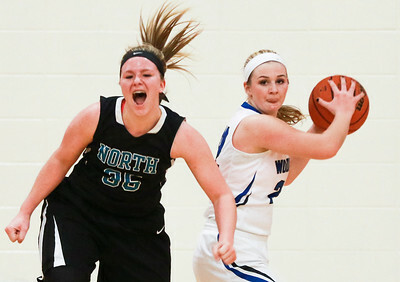 Sarah Nader- snader@shawmedia.com Woodstock North's Rachel Schaffter (left) is guarded by Woodstock's Jenifer Crain while she dribbles down court during the third quarter of Thursday's Class 3A Marian Central Regional final February 19, 2015. Woodstock beat North, 57-48. Sarah Nader- snader@shawmedia.com Woodstock North's Haley Ahr (left) celebrates a point during the second quarter of Thursday's Class 3A Marian Central Regional final against Woodstock February 19, 2015. Woodstock beat North, 57-48. 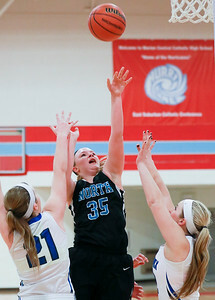 Sarah Nader- snader@shawmedia.com Woodstock North's Haley Ahr (center) shoots during the fourth quarter of Thursday's Class 3A Marian Central Regional final against Woodstock February 19, 2015. Woodstock beat North, 57-48. 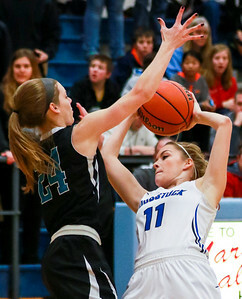 Sarah Nader- snader@shawmedia.com Woodstock North's Rachel Schaffter (left) guards Woodstock's Colleen Brown while she has control of the ball during the first quarter of Thursday's Class 3A Marian Central Regional final February 19, 2015. Woodstock beat North, 57-48. 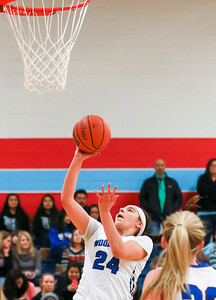 Sarah Nader- snader@shawmedia.com Woodstock's Selena Juarez shoots during the first quarter of Thursday's Class 3A Marian Central Regional final against Woodstock North February 19, 2015. Woodstock beat North, 57-48. 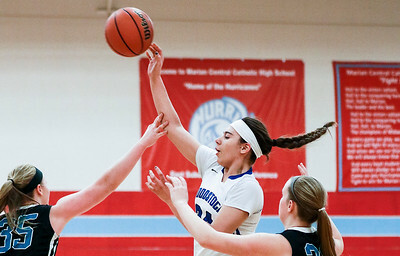 Sarah Nader- snader@shawmedia.com Woodstock North's Haley Ahr (left) guards Woodstock's Gabriella Scolio while she shoots during the second quarter of Thursday's Class 3A Marian Central Regional final February 19, 2015. Woodstock beat North, 57-48. 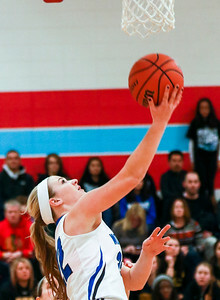 Sarah Nader- snader@shawmedia.com Woodstock's Bracken Overly shoots during the first quarter of Thursday's Class 3A Marian Central Regional final against Woodstock North February 19, 2015. Woodstock beat North, 57-48. 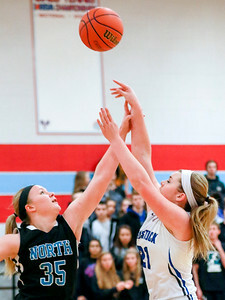 Woodstock North's Haley Ahr (left) guards Woodstock's Gabriella Scolio while she shoots during the second quarter of Thursday's Class 3A Marian Central Regional final February 19, 2015. Woodstock beat North, 57-48.